For over 25 years, the restoration of the old landmark Roman Catholic church in Grenville into a cultural centre, museum, and art gallery has been an unrealised dream of the St Andrew’s Development Organisation (SADO). According to the recollection of one of the organisation’s founding members, Nadia Benjamin MBE, the European Union made available $3 million for restoration projects on the island in 1995, but to date, the project never got off the ground. 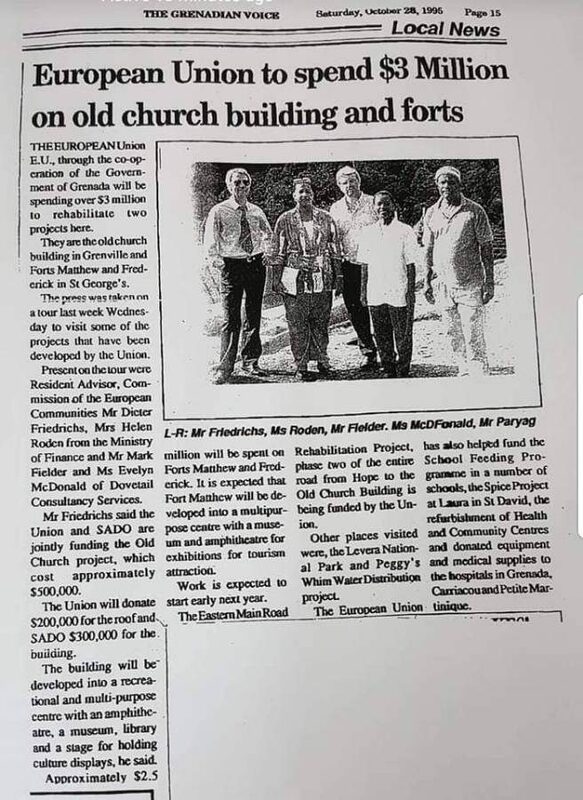 Benjamin said that $500,000 part funding was received to be allocated for the restoration of the church, while approximately $2.5 million was expected to be spent on Forts Frederick and Matthew, to turn Fort Matthew into a multipurpose tourist attraction centre with a museum and amphitheatre for exhibitions, as was reported in the Grenadian Voice on 28 October 1995. “The organisation lamented on the fact that we didn’t get the money, but no matter what we said nobody took us on because we knew where the money went, because it came out that it was to be put in the estimates of revenues and expenditure for the next year, and so many years passed and we never got it,” Benjamin said. The Gothic Revival Style building on Cook Hill Road, Grenville was decommissioned as a place of worship in 1915, 82 years after the first cornerstone was laid on the 4 April 1841, due to mosquito infestation. It was used as a primary school until 1972, when it was again abandoned. Benjamin said it is regrettable that the executive of SADO who followed years later did not continue the advocacy for the restoration of the church, therefore, the dream is now relegated to being just a faded memory. Benjamin, whose deceased husband, Reynold Benjamin was elected the first President of SADO, said the old church is not the only historical site that needs urgent attention. Benjamin is still hopeful that the project will be revitalised as it can boost the economy in the big parish which continues to be neglected. The present deteriorated state of the church still holds much historical significance in the town of Grenville. Before being built in its present location, the first Catholic church was located in Marquis, but it was the foresight of Father Angelo Leoni, the first parish priest that decided to relocate the church. Father Leoni died in 1846 without completing the roof of the church, which was due to funding issues, and is said to be buried beneath the altar of the church. His unfinished work was later completed by Father John Andrew Wall in 1858 who died in 1863. Well said Benjamin..it seems like (SADO) needs people like you within their organisation, passionate and outspoken individuals, ( leaving politics aside) who may be able to kick backsides or be a thorn in individual rear end to get things done. Its interesting to hear the comments made about tracing the funds due to the long time lapse and it will take time to trace. what they really mean is that we will leave it a long time and hopefully it will be all forgotten about.. Thanks ADM for supporting Grenada. I welcome your response although the interest in SADO is not about a table sit. This organization has been around for quite sometime and I suggest it’s founders vision, based on the name, was about pioneering growth of the big Parish economic as well as infrastructural development, thus, participating with government and the people of St. Andrews with hope of making these positive differences. The Rainbow City Festival which I learned came about as a result of SADO has gone the way of the dinosaurs but I am not aware of further achievements by this long surviving group. To revive themselves going why don’t they publish a bulletin with all their major accomplishments as well as charting the way forward? I haven’t heard SADO’s name called in Agricultural development, Tourism development nor Infrastructural development among the Parish, though I just might not have been in places I could have heard. But governments need you SADO and Grenada needs you too. I listened to the speaker in the above video and her comments are spot on as it relates to development in Grenada. NNP government/s have little or no interest in development outside of St. George’s. I am of the opinion that Keith Mitchell and Gregory Bowen makes up at least 75 percent of that party’s power and thus the government. Hence, the four St. Andrews representatives and others are merely tokens or symbols of power. I feel aggrieved though, as I look and listened to the lady speaker, that there was no sense of urgency in her voice nor emotion. Grenada is not St. George’s must now be spoken with deep feelings and emotions as the NNP under Keith Mitchell and Bowen has been a colossal failure. But too, why SADO is so week. The disgrace stared me in the face when some time in the past I drove by this Old Church and saw the St. Andrews Development Organization (SADO) sign on this historic but dilapidated eye sore and I wondered, what a great contrast between the building and the name of the organization…SADO’s meetings was held at that building at the time. But NDC must be the most docile and blinded political party on terra firma. What? Do they have the same national development platform as NNP that they remain mum while the south of the island is tipping over with activities and we in St. Andrews and others gets nothing? Their four self-destructive years at the helm from 2008 at least showed differently with their effort to open a UWI facility at Hope in St. Andrews. But Seems like the day after NNP won the election of 2013 the next day the sign went down with Mitchell and Bowen silently saying if There’s no space in St. George’s got it. We don’t need it.